Senior Brittany Leuthmers celebrates with her teammates after winning a point. Leuthmers recently earned the honor of MIAC Defensive Player of the Year for the second consecutive year. For the sixth time in it’s programs history, Gustavus Volleyball holds the Minnesota Intercollegiate Athletic Conference Championship title. Last Friday, the Gustavus Women’s Volleyball team finished out their last match of the season with a perfect conference record by defeating St. Mary’s with a four-set win. The Gusties started off the game strongly, winning the first two sets with scores of 25-15 and 25-19. After dropping the third set by a score of 17-25, the team thundered back in the fourth closing the game off with a score of 25-18. 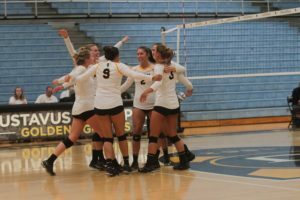 The Gusties closed with an overall record of 25-2 and undefeated with an 11-0 record in the MIAC, this included six shutout wins and zero five-set matches. This is a stellar improvement from last season’s record with an 8-3 in the MIAC and a 26-7 overall. Sophomore Kate Holtam prepares to spike the ball during a game Oct. 20. The team continued to bring their strong offense with a .374 hitting percentage. Sophomore Kate Holtan continued her offensive hot streak by leading the team with 15 kills and .367 attack rate with 15 digs on the back line for her 14th double-double of the season. Senior Brittany Luethmers finished out her last regular season match with the Gusties by leading the defense with 20 digs. Senior Nora Holtan, just coming off of being the first Gustie to get AVCA Player of the Week honors, made a notable 47 assists in the match. The MIAC currently boasts six of the top ten teams in the region, with Gustavus holding the No. 1 spot, so to go undefeated speaks volume to the team’s abilities this season. 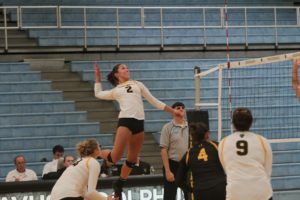 Holtan and fellow Senior Lauren Hanson spent some time reflecting on this past season, from obstacles, injuries, new faces, and the bittersweet ending of their volleyball careers. “We’re really excited going into playoffs in the first seed, like every team we have overcome obstacles towards the middle of the season while balancing midterms and learning to push through and be in the moment,” Hanson said. Hanson said she was impressed with the chemistry the team had from the beginning of the season and the way they integrated the new players into the team. “We’re also proud of our First-years for adapting to the team and having an amazing season. They came in and learned a lot and became a prime piece of motivation for our upperclassmen to perform even better. All of them play a crucial role,” Hanson said. Nora Holtan also was proud of the team’s resiliency to close out the season in such a strong manner and push through the difficulties the season brought. Members of the Gustavus volleyball team celebrate after earning a point. Head Coach Rachelle Sherden, who recently received the honor of MIAC Volleyball Head Coach of the Year for her efforts in leading the Gusties to an undefeated MIAC record, is taking the approach of focusing on one game at a time as the team heads into postseason.